Traditionally, atlases have been and are still published in book form or as single map sheets assembled in a map case. Such conventional atlases offer the user a clear structure. Although paper atlases allow for browsing through the different chapters, they also guide the user by their sequential setup. Atlas chapters and themes are arranged to facilitate the best possible way to com municate spatial information. Further advantages of paper atlases are the easy access (i.e., independency of computer technology) and the nearly unlimited atlas format and size, which allows for customizing maps to a certain region or area portrayed. On the other hand, paper atlases do not support advanced geovisualizations like animated maps and other multimedia features. Nowadays, many conventional paper atlases are com plemented by a digital version, which can offer those features. More and more atlases are nowadays produced as elec tronic versions. Whether an atlas is produced as a con ventional paper volume or an electronic medium is dependent on a number of limiting factors affecting its production and use. Prominent among those are acces sibility of potential atlas users by the presentation and distribution medium selected, production costs, finan cing, and user access to computers. Nowadays, electronic atlases are predominantly distributed on CD ROM, DVD, or are available online. All three types of electronic atlases, to a different extent, allow for a combination of various visualization formats such as static and animated maps, videos, photos, 3D models, etc., and can therefore also be referred to as multimedia atlases. Electronic at lases are not limited to a predefined order of chapters and maps like paper atlases but allow for random access of maps based on the user’s needs. They also offer a wide range of digital visualizations of spatial information for on screen display and use. Depending on the level of interactivity, a distinction between three types of electronic atlases can be made. (1) View only atlases contain maps that can be randomly displayed but do not allow for any other interactivity than navigating through the atlas. 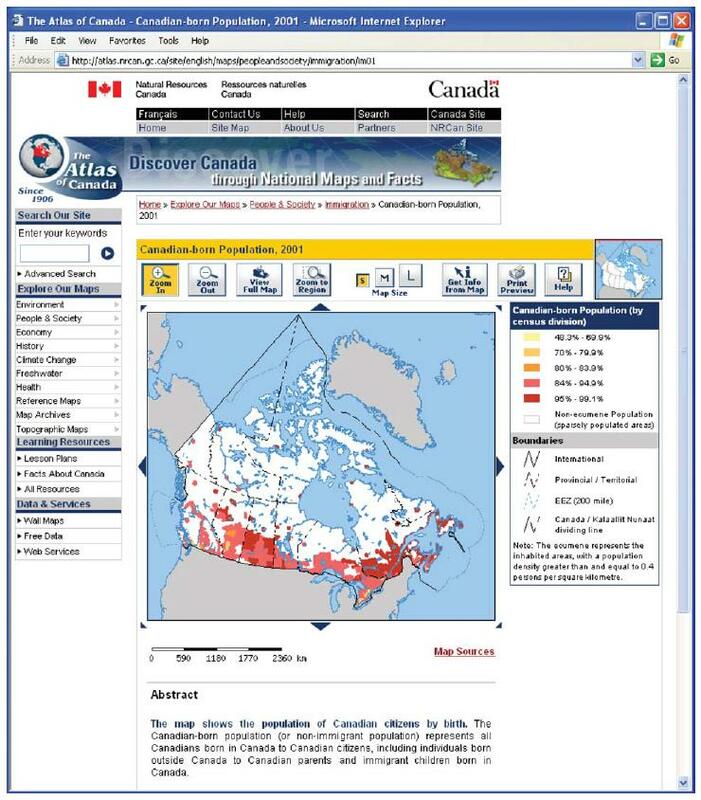 (2) Interactive atlases allow for interactive map use by means of manipulation of the data sets contained. In an interactive atlas the user can change colors, choose different symbols, adjust classification methods, change the number of classes, etc. An example of an interactive atlas is the Atlas of Switz erland Interactive, published on CD ROM and DVD. (3) Analytical atlases allow for the highest level of interactivity facilitating additional object query functions and are not limited to predefined map topics. The user can choose themes depending on individual needs, combine different themes, and conduct computations on areas and themes. Designed to its full potential, an ana lytical atlas offers major functionalities found in geo graphic information systems (GISs). Most interactive and analytical atlases offer the ad vantages of the following interactive features: (1) meas urements of geometrical information like distances and areas, (2) changing the map extent by moving it (panning) and scaling it (zooming), (3) searching for places, objects, and locations by means of search engines or hyperlinks, (4) production of customized maps in regard to display and visualization of themes and geographic objects, (5) use of multimedia features such as photos, videos, sounds, and animations, and (6) visualization options that allow the user to aggregate thematic data to different spatial units or to change the type of data (e.g., absolute and relative values), offering new views and possibly new insight into the topic under investigation. In the age of digital information and communication, atlases are increasingly being produced as electronic atlases for online use, like the recent national atlases of Canada (Figure 2), the United States of America, or Sweden. These atlases can easily be updated and there fore can function as current information services or geographic data warehouses. These services facilitate easy access to official geographic data for the public.